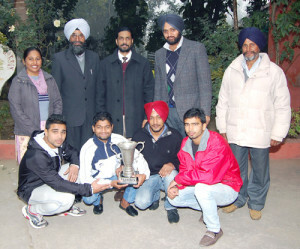 M. M. Modi College, Patiala has won Punjabi University Inter-College Judo Championship (Men) held at Govt. Rajindra College, Bathinda on 10-11 January, 2014. In 73 Kg weight & open category Vashishat Gill won two gold medals and in 60 Kg Weight Category Pawan Paney won one gold medal. In 56 Kg weight category Devinder won one silver medal. The College got runners up position in Judo (Women) also. In 57 Kg weight and open category Ms. Pooja Chaudhari won 2 gold medals and in 44 Kg Weight category Anu Rani won Silver Medal, and Ms. Jyoti in 63 Kg category and Ms. Parneet in 73 Kg category won the bronze medals. College Principal Dr. Khushvinder Kumar and Chairman, Sports Committee Dr. Gurdeep Singh welcomed the team members and applauded their achievements. They also appreciated their team incharges Prof. Nishan Singh and Ms. Mandeep Kaur. 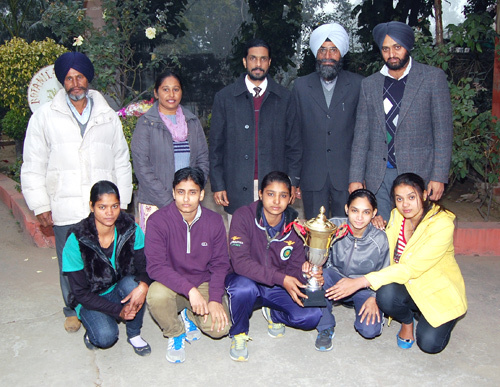 The principal further informed that Ms. Pooja Chaudhary has already made the college proud by bagging 5th position at Junior Asian Judo Championship held at Henan (China) during 10-11 Dec. 2013.